Chocolate, what does it mean to you? Does the very word tantalise your taste buds? Is it what your heart most desires? 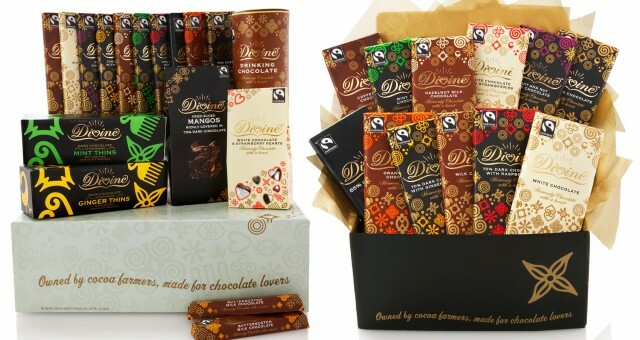 Well, Divine Chocolate has all this and more to offer you. Made with the finest quality Fairtrade cocoa beans from Ghana, this outrageously delicious chocolate is a real taste sensation and you’ll have a chance to experience it like never before with the start of the nation’s favourite week – Chocolate Week. From Monday 14th October to Sunday 20th October, this Chocolate Week, Divine is giving you the chance to sample a selection of new recipes made exclusively by its finest chocolatiers. Voted Observer Best Ethical Business, Best Social Enterprise and collecting two awards at the Great Taste Awards (Guild of Fine Food), Divine’s products are a treat for your tastebuds and your conscience. Divine will be hosting chocolate-themed events occurring in countless shops, hotels, and restaurants all throughout the country to mark their favourite week. For a chance to win, simply answer the question below. There’s also another opportunity to win a bundle of chocolatey goodness if you come over and say hello to us on the Ole stand at Office (8-9 Oct, Olympia London). The closing date for entries is Sunday 13th October. Terms and conditions: To be eligible to enter this competition you must agree to the following terms: Agree to have your details passed on to Divine Chocolate to keep you informed about new products and offers. This entry was posted in Win.